The TMNT are exploring the woods, led there by Donatello on a spiritual quest. Earlier in the week, Splinter had sent Don to a specific place in the forest, where the young terrapin said he had met the “Father of all reptiles,” some sort of ghost or spirit. The rest of the guys doubt Donatello’s story, but Splinter angrily admonsihes them for not being in touch with their heritage, one that stretches back millions of years to when the dinosaurs roamed the earth. Splinter states that everything is a ring, and what rises must fall… and as the mammals overtook the planet when the reptiles died off, so too will the mammals cease to exist. Raph, Leo and Mike are still doubtful of Don’s vision, so their Sensei sends them into the woods to find the spirit as well. The next morning, the other Turtles awake to find their brother missing and set off to search for him. 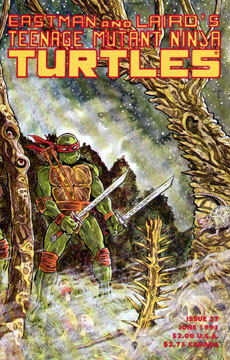 Donatello once again leads the way, feeling the pull of an unknown source that Raphael and Leonardo are unaware of. On the second evening a heavy fog sets in, and the brothers become separated. In short order, Don and Leo discover that Raphael has gone missing. The next morning Donatello is acting strange and talking in a strange voice. This eerie activity sets Leo off and he yells at Donatello. Don explains that they’re on the Eternal Ring, that they are the avatars of the reptilian race… but the Ring has been broken and the Turtles must repair it. “He told me so.” Don states. “Who told you this?” demands Leonardo. “The Father of us all.” replies a euphoric Donatello. This statement only angers Leonardo further, but the two set off to find their siblings. As they progress through the briar infested woods, Leo has to struggle with Herculean effort to cut a path, and yet Donatello passes through the woods with ease. Meanwhile, Raph and Mike have found one another. Both are battered and bloodied, Raph in particular. Michaelangelo has found their equipment and supplies, the water proving to be a great asset. Slightly refreshed and better armed, the two brothers set off to battle the beast that put them in this condition. Shortly thereafter, Don and Leo are ambushed. The brothers manage to fend off their attacker without getting a good view of it. During the battle, Leonardo even managed to cut off one of its arms, which is long and hairy and ends with a giant clawed hand. “You are learning.” Donatello tells him. The brothers set off once again, and quickly the fog returns. The Turtles prepare for an assault and they are not disappointed, as a gigantic shadowy form erupts from the mist with violent force. Don is injured almost immediately and can’t continue the quest. Leo refuses to leave his brother behind, but Donatello tells him that he must, as the Father of all turtles needs help. Leo steadfastly refuses to leave, but Don will not acquiesce… for it isn’t Donatello who is the shaman, but Leonardo. Don bursts into tears and commands his sibling to complete their mission before the beast returns. Crying, Leonardo leaves one of his blades with his brother and sets off. As Leonardo progresses, he is contacted by a voice. The specter tells Leonardo that it is pleased that he is so distraught, as it has opened the door between them. Leonardo climbs a precarious rockface as the voice speaks to him. Leo makes it to the top, and sits back in exhaustion. The voice has left him, and he hears the sounds of the approaching beast… yet it doesn’t attack and moves off. Leonardo doesn’t understand why the monster won’t attack, and eventually falls into a deep sleep, where the voice returns. “This is my nexus, my holy spot. This is my prison, where I am trapped by my sadness. Dream my child… dream of extinction. Dream of death. Once we were, now we are not. You and yours are what we could have been – had not the hairy ones come. All the scaly brethren are my children… but the hairy ones killed them… THEY ATE MY EGGS! Leo’s sleep is suddenly interrupted by the monster, who has finally decided to attack. The lone Turtle leaps into action as the voice continues. The battle continues on, bloody and barbaric. Leonardo strikes his foe again and again, yet it continues on… until we see an apparition of a great turtle form in the clouds above, when Leonardo finally delivers the death blow. Below, Raph and Mike have found Donatello and are struggling to climb the rocks. Mike sees the cloud turtle, and Donatello tells them that it’s a good omen, that the quest is complete. Raph insists that they continue onward, but Don’s injuries prevent him from going further. “It’s finished. We don’t have to hurry now.” Don tells his brothers. “It doesn’t matter.” insists Don. Raph and Mike continue on, and find their shaman, sitting atop the precipice. Leonardo sits with his katana in hand, his vanquished foe in pieces around him, leaning against a gigantic, broken eggshell.